Humor : Age: Older than Dirt! Those are all Avast files and the error report should go away after the next update of Avast and a reboot of your computer. Nothing to worry about. thanks, that is what i hoped. Repa, Here's another scr shot like the one above, but, with more entries that was unable to scan. Is this still nothing to be concerned about? This is not a problem and is simply a result of the previous days definition files being called up to scan and then being cleaned up by avast before they are scanned, meaning that avast can't find them when they are to be scanned. I have not seen this in any of my daily quick scans, but have not upgraded avast program to the latest version yet. What version of avast are you using? Avast 8, that I told you about, & I was wondering if this version was causing this to happen. As long as I've had Avast, I'd never seen this happen before. PS: I've posted another question earlier that I don't think you've seen yet, Topic is "Unwanted Desktop Icons, HP & Others", maybe you can take a look at it, please. I don't know, but it isn't anything to be concerned about that I can determine. » Are these pop ups real or hoax? 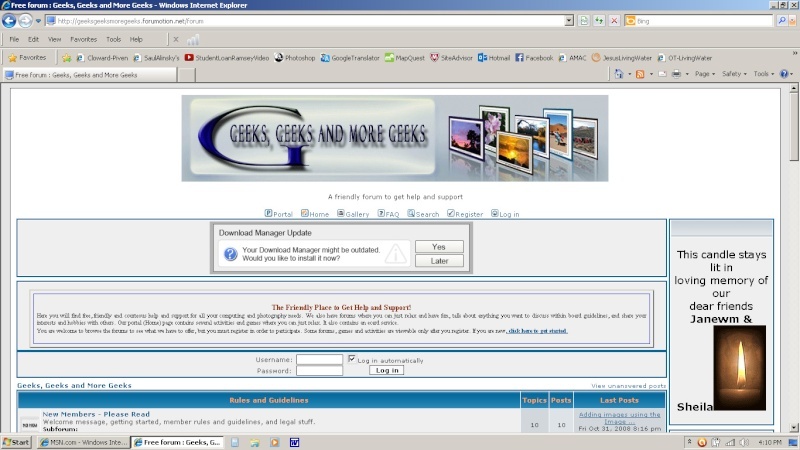 Just noticed that when I went to logon that there is an ad under the Geeks Logo that says, "your Download Manager might be outdated. Do you want to install it now?" Don't fall for it! Ignore it!